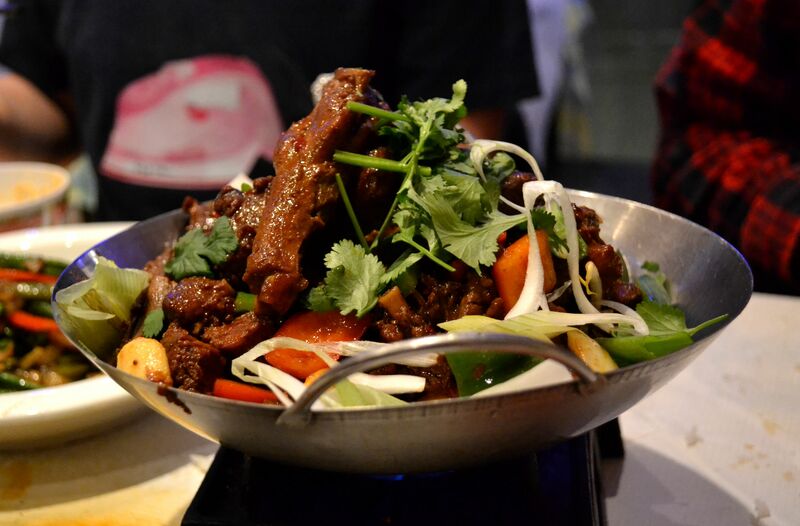 To say that I am a fan of Szechuan food would be to grossly understate an essential truth. I have a hereditary predisposition for Szechuan food, passed down to me from my father (a Jew from New York for whom Chinese food is second in his heart only to my mother’s marvelous Polish-Jewish cooking). Like my dad, I LOVE Szechuan food, love the mingling of chili and numbing Szechuan peppercorn and spicy pickle and cured meats, the hot pots and smoky dark sauces and dense irregular hand shaven noodles, the pervasive garlic and fried peanuts and the crisp snap of vegetables rapidly cooked at extraordinary heat. Since the first month I moved to London, more than two years ago, my friend V has been telling me we had to go to Gourmet San: bona fide Szechuan food, in Bethnal Green. Then there was Jay Rayner’s review – homage, really, to the dry-cooked Szechuan crab, which in and of itself would have propelled me eastward. But we’ve been busy (you know how things get) and we never quite pulled a plan together. In January, however, I moved, and while I was experiencing the sense of crisis and acute dislocation arising from having in boxes all the things that made the place that I occupied feel mine, V wisely invited me to dinner there with her friends G and R, who used to live around the corner from Gourmet San and have been there dozens of time. The mark of a great Szechuan restaurant (IMO) is that when the food hits the table, conversation eventually dwindles until it stops completely and the only noise is slurping and chopsticks tinkling against bowls and an occasional involuntary pleasurable moan. 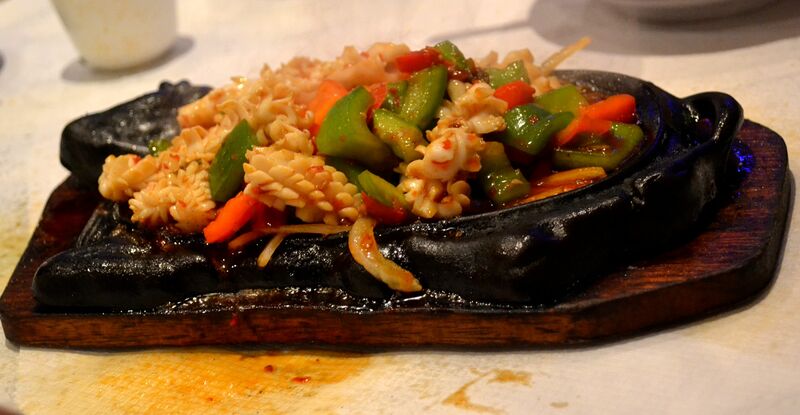 I won’t hold you in suspense: Gourmet San handily passes my Szechuan food litmus test. 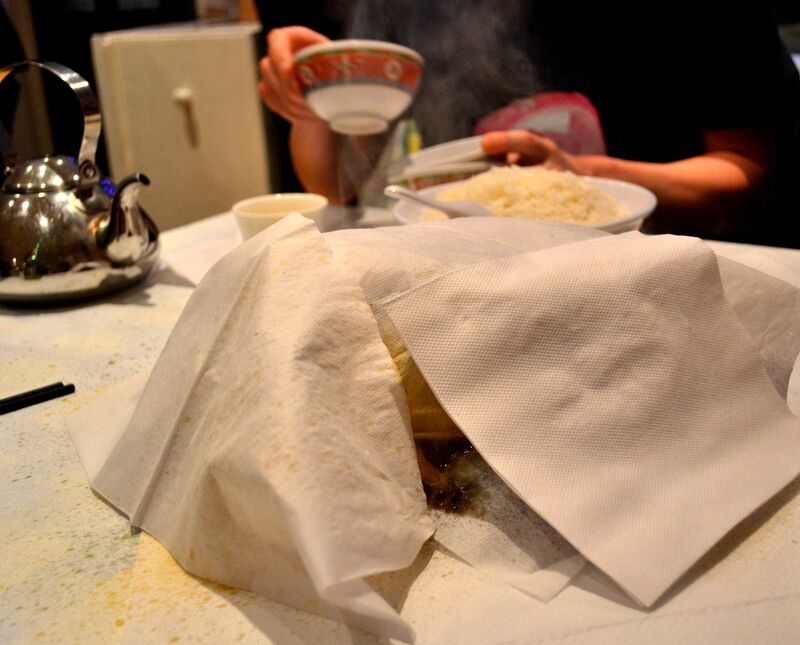 The sizzling squid was so hot and furiously spitting oil and sauce that the server blanketed it in a paper napkin, under which it sputtered and popped for a good five more minutes, saturating the table with hot oil and filling the air (and our hair and clothes) with slightly acrid, oniony, peppery smoke. (It was the first dish to arrive and a not a single piece of crockery, or patch of table, escaped the spray — and I’ve got photos to prove it.) The fresh tender squid was deliciously, if simply, cooked in lightly spicy oil with peppers and onions. It was particularly tasty when eaten piping hot. A dish like this is not so much my thing, but it was friend G’s favourite dish on the table. These initial dishes were good, but at a certain point, almost certainly coinciding with the arrival of stir fried long green beans with aubergine (£8), the meal became utterly magical. The crisp garlicky beans had been cooked at such high heat their skin was blistered, and the aubergines were molten hot unctuous caramelized umami perfection. You wouldn’t necessarily conceive of this as a combination that worked, but my god it did. At £15, the Spicy Duck with Beer in Hot Pot was one of the more expensive dishes on the menu (in the “Chef’s Special’s section) but seriously – with a name like that, how could we not order it? The duck had been braised and was caramelized such a rich brown that I would have guessed it was meat or game. Served over a gas burner, with plenty of fresh coriander and a few vegetables, it was swimming in a dark, complicated, anise-scented sauce, tingly with Szechuan peppercorn, with a generous layer of spicy chili oil on top. The longer it bubbled away, the spicier and gamier the duck became. But what about the CRAB, you say. Well, I’m saving the best for last, of course. I’m choosy about my Szechuan crab, having had the best crab I expect I will ever eat outside of China at Szechuan Chef in Bellevue, near Seattle. 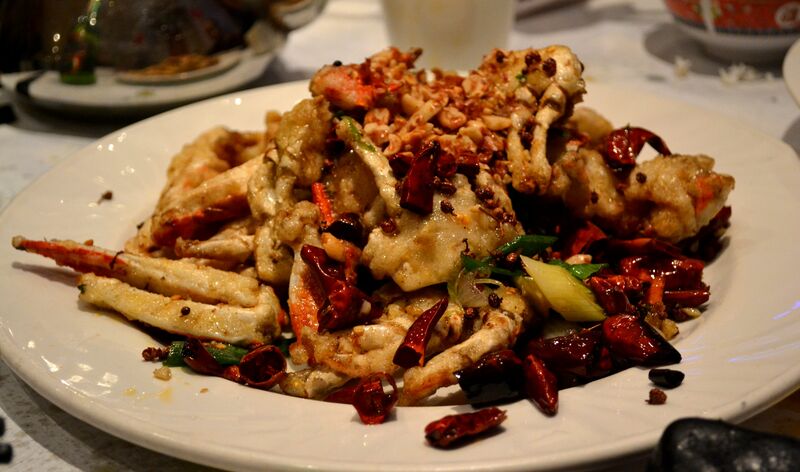 This crab gave Szechuan Chef a run for its money. It lacked Szechuan Chef’s achingly perfect balance of sweet, spicy, and salty, but I nevertheless found myself grabbing chunks of lightly battered, salty, tangy claws and sucking and chewing on them in an agony of bliss. Gourmet San is not fancy. It is not fine dining. Its white tablecloths are made out of paper. It is EXTREMELY brightly lit. I realized sometime into our meal that on the giant television screen (which was behind me) they were playing a very graphically violent World War II movie involving lots of Japanese soldiers getting blown up gruesomely (in Chinese, naturally, which most of the patrons were watching attentively). But frankly who cares? Not me, certainly, especially when the food’s this good. It’s one of those restaurants where even when you’re gut-bustingly full you’re still jealously peering at the other tables. (“What are they having? Is that steamed fish? How’d we miss the steamed fish? We have to come back and have the steamed fish.”) I can’t WAIT to go back. The crispy pig intestines (if not the steamed fish) and I have a date with destiny. The best thing, other than the food, is how inexpensive it is. Even with beer, gratuity, and a mediocre fried banana dessert (not pictured, since all my photos look rather obscene), we spent £20 per person. Best £20 I’ve spent at a restaurant in quite a while. 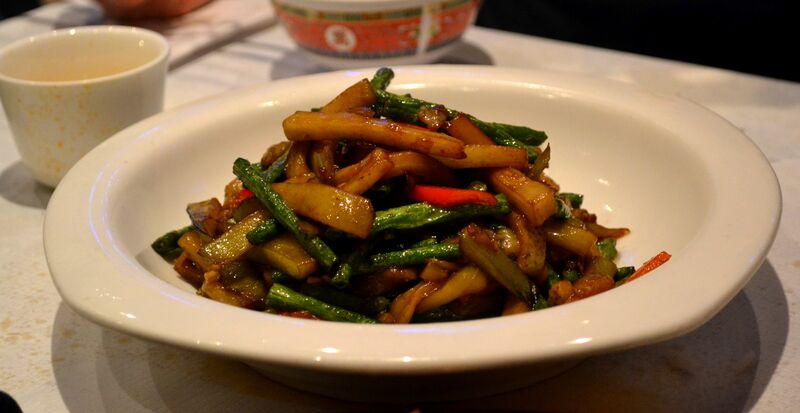 This entry was posted in Bethnal Green, Budget, Chinese, I'd eat here again, London Restaurants and Reviews by Area and tagged Szechuan by Susan. Bookmark the permalink. Ooooh! That all looks so good. That Santa plate is hysterical. My mother has Santas (and Buddhas) all over the house. Once, in May, I protested and said that it was time to take down the Christmas decorations. So another Western icon is co-opted . . . I LOVE that. In fact, the more I think about it, the more I love it. Hilarious. I’ve heard so many good things about this place, but have never been. A travesty, i know. 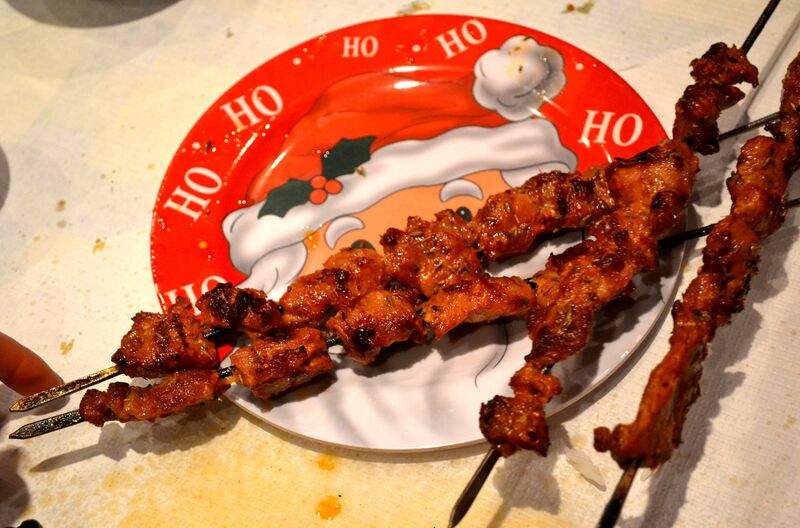 Still, i did go to its younger sibling, My Old Place, where I got to sample those lamb skewers. Heaven. My current yardstick is Chilli Cool in Bloomsbury which does ace crispy fired intestines, a lovley set of dry fried green beans with minced pork and an unbearably morish and richly delicious fish fragrant aubergine. Heaven on a plate. Especially with all that wonderful spicy, hot, numbing seasoning. I’ve heard good things about Chilli Cool but I’ve been unreasonably suspicious because it’s in Bloomsbury. With your rec, I’ll have to check it out. I’ve been to Chilli Cool and it is really nice. Nearby is Red N Hot in Euston, another Szechuan restaurant. Reading other reviews Red N Hot isn’t meant to be as good but I found it awesome. Really enjoyed the spicy beef soup we ordered. I’m off to Gourmet San tonight and from the review above I think I’ll be trying the crab. Brilliant! Do let me know if it lives up to your expectations, and if you order any other ‘must-try’ dishes (or misses). I’m with you, I love Szechuan food. This place looks really good. I think we only have a couple of Szechuan Restaurants in the whole of Sydney. Odd how they always like the TV on isn’t it? Yes. Odd/hysterical. That war movie was something else. Lovely—makes me wish I were in London right now. It’s the kind of food that makes you happy. Thanks so much for dropping by! After today’s lunch I just stumbled onto the blog, so much great stuff here! So here’s the thing: I love Gourmet San and ANYTHING involving beans is a disappointment in other London Sichuan places. However, Sichuan Folk in Hanbury St. is another great bet in the area and I can only second opinions voiced on Chilli Cool, very good. However, there’s only one place where you see a man chargrill things in a phone booth sized compartment in the middle of the restaurant, and that’s on the Bethnal Green Road. Love it.